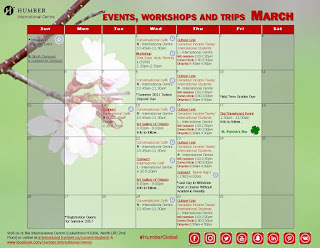 Your Humber World: Our March Calendar of Events is Here! Check it out for a month full of workshops, conversational cafes and income tax knowledge brought to you by Culture Link. As a bonus, March 17th doubles as Toronto's St. Patrick's Day celebrations AND your very last chance to head out on a ski and snowboard escape with the Humber International Centre. Keep this calendar on hand and don't miss a thing! Changes to Travel Regulations Could Affect You! February Calendar! Reading week is coming!